This particular BotF correspondent is counting himself pretty lucky because he works near what is the epicentre of the Sydney CBD’s Small Bars. I think it’d be fair to say that Sydney’s inner East and West dominate Sydney’s overall small bar scene – but there’s a decent range in the City within a 6 block range south of George Street and East of Druitt Street. This is remarkable because some of Sydney’s worst bars also exist in this precinct (The Orifice, the Sh1tty and Sediment Bar to name the leading contenders). Yet again, barzine.com.au has blazed the trail for us. It followed up its review of Spooning Goats with a review of the Mojo Record Bar. Now I didn’t read the review closely and a colleague and I rocked up at about 1pm and started drooling at some @Untappd uniques in the fridge and waited to be served. Turns out we were early – and we were politely sent on our way. 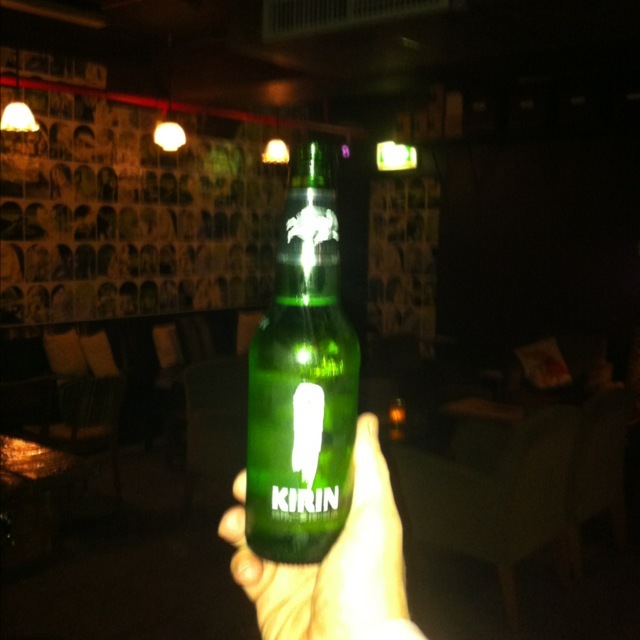 Using barzine.com.au, I quickly confirmed the locale of another small bar close bar and visited The Grasshopper bar. 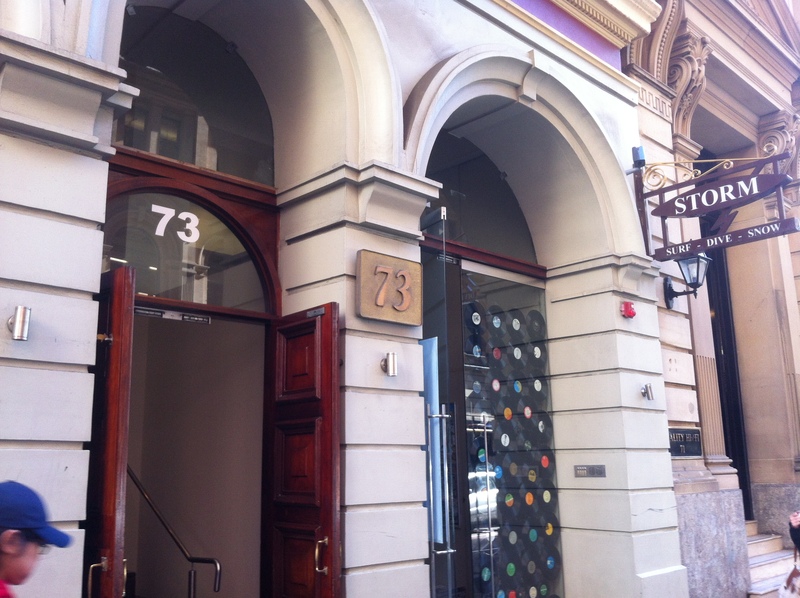 Like many of Sydney’s CBD’s small bars, you really know where you are going. 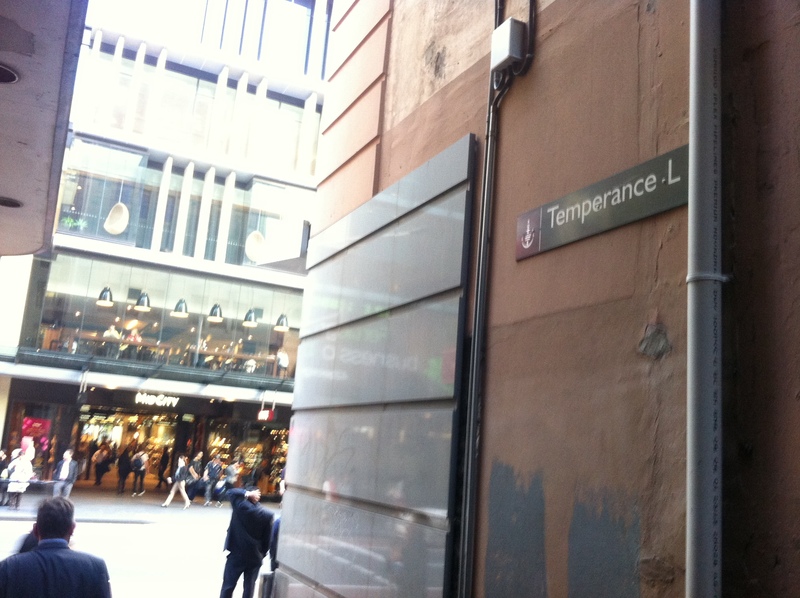 I thought I knew the CBD pretty well, but had never heard of Temperance Lane. It’s a slice of Melbourne in Sydney with wall artwork and a couple of neons. Grasshopper Bar is accessed through an small doorway and there’s a small bistro upstairs and Grasshopper Bar downstairs. Very dark, even at 1.10pm in the arvo – and empty. We grab a stool at the bar and ask for a beer list. The barman shows us a bottle and says – “This is the beer list”. This is a great bar – but beer’s not their thing – and that’s fine. The Kirin First Press Beer has graced these pages before, but it isn’t Japan’s finest. I popped into Mojo the following evening and at about 7pm, it was pumping. It was lucky I’d seen it the day before with the lights on to appreciate how well they’ve appointed the joint – because in the evening you can barely see 3 feet in front of your face. I also wasn’t aware there were so many hipsters in the CBD – maybe there’s a special bus from Newtown that picks them up. It was so busy and I was pressed for time, that I deferred my first beer until later. The next arvo, I was able to get in, grab a seat and lay my hands on a double unique. Mojo Record Bar is a top shelf small bar – great vibe, great names for cocktails (Smells Like Gin Spirit), great memorabilia on the walls and a fabulous beer list. Just a little more wattage on the lighting. For me the highlight of Mojo Record Bar is their beer list (attached). Coopers Pale Ale is the macro of the lot which is a bloody great quaffer. They sell growlers (not sure if they’re take away) and there’s beers and ciders from SA, Victoria, NSW and Tasmania. Whilst there were 6 other @untappd uniques on the list, I couldn’t go past the doubly unique Huon Dark Apple Ale. Doubly unique because I hadn’t had this specific beer and I hadn’t had a Dark Apple Ale before. 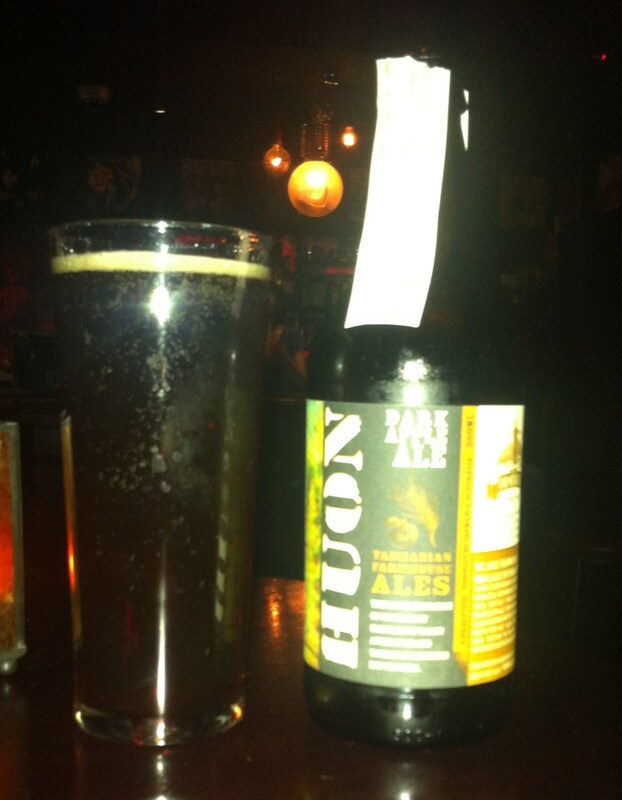 Huon Dark Apple Ale is made by the The Two Metre Tall Company. This brewer has just won a Churchill Fellowship for 2012, and he’ll spending time learning about brewing techniques in Europe and the US. I wonder if there is a Churchill Fellowship for beer drinkers? This beer is lovingly made and I haven’t seen such an exhaustive list of ingredients. It is made with 25% apple juice that is added to a dark ale base. Beautiful colour and a smooth taste. The apple is omnipresent, but despite some trepidation on my part it was far from cloying – but really, really worked – loved the maltiness. I’ll definitely be back to try this again. Very happy with the 500ml bottle, also. 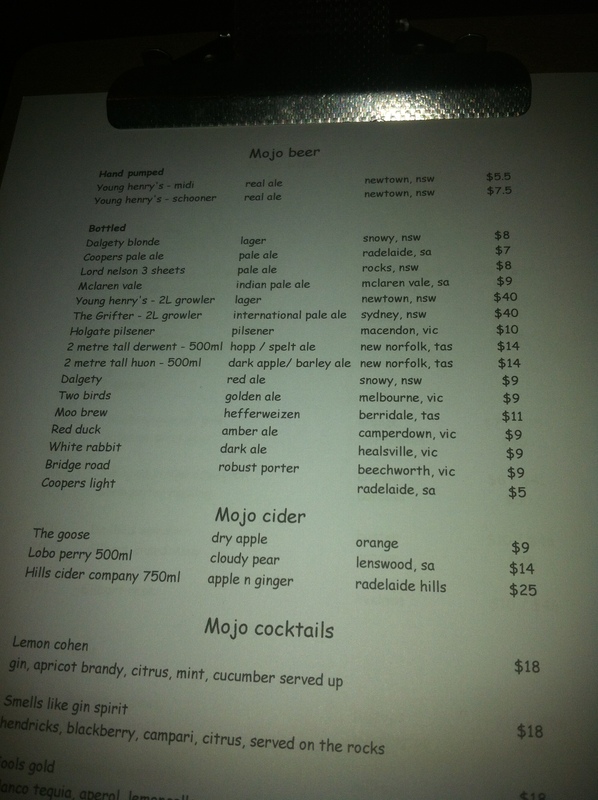 When I see things like the Mojo Record Bar beer list, it reinforces my belief that this is a golden age for beer drinkers.